It’s the sixth episode of the seven-part miniseries IT CAME FROM SYNDICATION! This time around, I continue my look at syndicated television from the 1980s and 1990s with a look at the “drama” category, which encompasses action, science fiction, and horror. I’m joined by friend and fellow podcaster Michael Bailey (Views from the Longbox) to talk about everything from Friday the 13th: The Series to Highlander. Pop Culture Affidavit Episode 85: Victory or Death! Greetings, listener. You have been recruited by the Star League to defend the frontier against Xur and the Ko-Dan armada! That’s right, it’s time to brush up on your video game skills and fly into my coverage of the 1984 sci-fi flick, The Last Starfighter. Over the course of this episode, I recap the movie and give it my review; plus, I take a look at the novelization by Alan Dean Foster, the comics adaptation from Marvel, the aborted toy line, and several attempts at video game adaptations. I also talk about sequel and reboot rumors. If there’s one genre that DC is known for as much as its superheroes, it’s science fiction. A staple of the company since it’s very early days, it has spawned thousands of stories, and in this episode I take a look at 80 years of DC Comics’ science fiction. What’s covered, you ask? Don Drake on the Planet Soro, Tommy Tomorrow in “Columbus of Space,” Adam Strange in “War on Earth and Rann,” a story called “Killing Time” from Mystery in Space, Hex #11, and the Warren Ellis/Colleen Doran graphic novel Orbiter. Plus, interludes from Real Fact Comics that show us all what a wonderful future the Golden Age had in store for us! It’s time to beam aboard and join me as I take a brief look at one of DC’s most successful licensed properties comics: Star Trek. In this episode, I take a quick look at Star Trek (1st series) #33, an issue billed as a “Twentieth Anniversary Special” that has the Excelsior as captained by James T. Kirk and his former Enterprise crew meet up with the crew from … the Enterprise?! I am sure that everyone has a movie that he’s meant to see but never gotten around to. Moreover, I’m sure that there are plenty of people out there who are weirdly obsessed with the possibility that they may watch a certain movie, yet never seem to get around to watching. Or, as my father often says, they’ve seen “bits and pieces” of certain films. For years, whenever I would walk into Sayville’s Video Empire with my dad, the first place I would check out would be the science fiction/horror section. The reason for this was twofold: Star Wars movies fell under this classification and they were located along the right-hand wall next to the new releases. On the shelves were always random movies that to this day I’m sure nobody ever rented (ah, the early days of video stores where inventory meant whatever was actually available at the time) as well as the popular flicks. One of those was the 1984 movie Night of the Comet. 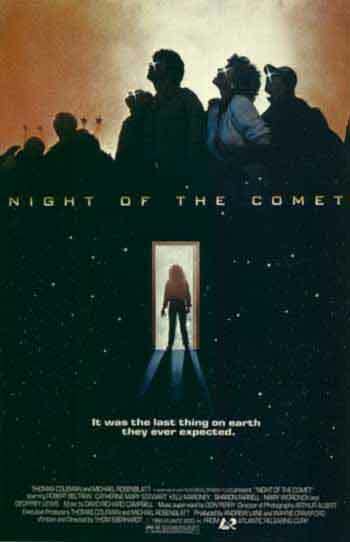 A film about teenagers having to make it in a post-apocalyptic Los Angeles, Night of the Comet didn’t do much at the box office and I would never had heard of it if I hadn’t been watching At the Movies with Siskel & Ebert on a regular basis and saw their review, which was pretty good for a movie that was nearly a B movie and didn’t do that well at the box office. But the concept intrigued me: everyone in the world has been wiped out, a few teenagers seem to have survived, and all is not as it seems. Plus, the poster (and the subsequent video box) was really cool looking. How could you go wrong with this? Comin’ on like a MEGAFORCE! Are you man enough? A comic book ad for the film. In some ways, I think that my fascination with the odd, often terrible things in popular culture starts with Megaforce. I get the feeling that few people know about this particular film and if there are people who do, I would be hard pressed to find some serious fans. It was a total misfire of a film when it came out and hasn’t at all better with age. 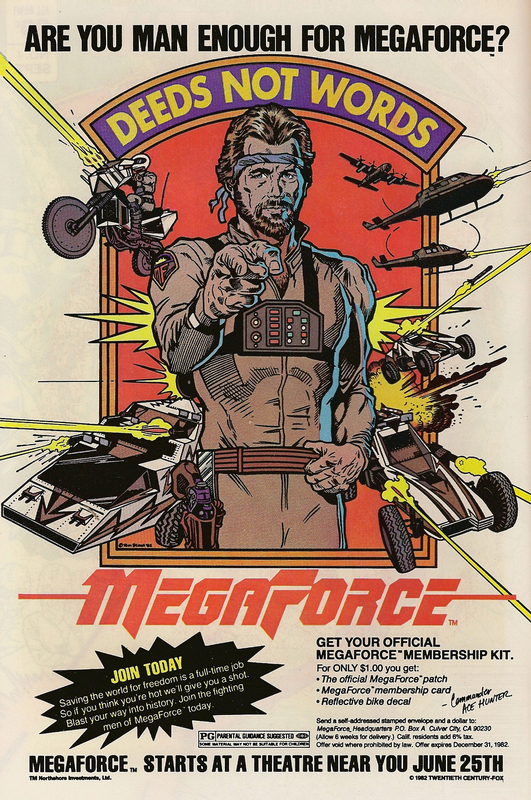 I first saw Megaforce on television when I was a kid. Well, to be honest, I saw the last ten minutes of it. Megaforce was one of those movies that netowrk affiliates would show when there was a hole in their schedules on a weekend afternoon because someone else was airing a baseball or football game and we weren’t in the era of all-golf, all-the-time on Saturdays and Sundays when Notre Dame isn’t playing. Saturday is still kind of a wasteland, but back then it wasn’t half bad because you could every once in a while come across The Breakfast Club or Better off Dead on WPIX if your mom hadn’t chased you out of the house already. It was fine, anyway. Most of my Saturdays were spent at friends’ houses or having them at my house to play Nintendo until mom threw me out of the basement with some sort of speech about playing outside. And if she wasn’t effective, the television was effective because this wasteland of programming would bore us enough to death to cause us to go outside and play wiffle ball in the backyard, eventually getting half of our balls caught in our huge elm tree. The first time I remember seeing the end of Megaforce was on one of these random Saturday afternoons. Tom Hackett and I had just switched off the Nintendo and rapidly turned the knob on the cheap Sharp Linytron television to see if we could find what was on the ten or so channels my house actually got. The images flashed by very quickly with a thip-thip-thip-thip so I don’t know how we saw the movie but we wound up landing on channel 7, WABC, and spent the next few minutes watching this guy on a soupe-up motorcylce. He was being chased by bad guys and tring to board what looked like a huge cargo plane. His compatriots were urging him on, and after a few moments, he figured out how to work what was obviously an experimental flying feature on the motorcycle, then flew through the air. Overjoyed, he hooted and hollared until he landed on the plane.